The Itty Bitty Kitty Committee: Be Afraid. Be VERY Afraid. We've got ourselves a teeny tiny vampire. you are so talented with their photos -- that is so freaking cute!!! TEEF!! Ferocious teef! Run away! Eeeeeee! Look at those scawy toofuses! 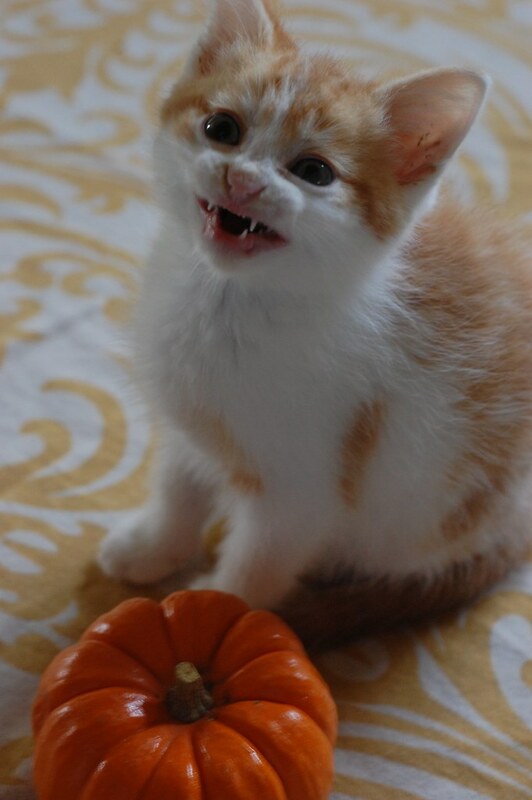 If Perry bites that pumpkin, will it turn into an itty bitty kitty too? Another sweet orange one? I seem to recall some vampirism among the LaBath kittens. he needs a little black cape photoshopped in. I'm terrified....see me run and hide screeching, "awwwwwwwwwwww" all the way! Oh, Perry, you may not be a "Darling" but you are darling nonetheless. Oooh, baby cat teefs. Nothing more cute and hilarious than a kitten trying to be menacing. Awww!! He does need a cape. Fierce teethies! how you got a kitten to 'smile' I'll never know. that is just adorable! Awww! What a mean-looking lil' punkin! Yikes! Is he hissing at something or just caught in an unfortunate moment while about to yawn? Intimidating little fellow (but only to my fingers -- my heart still loves him). Ok, seriously, how did you manage to get such a perfect Halloween picture - I mean you must have some sort of kitten magic that you aren't telling us about. The odds of getting that perfect little vampire picture this close to Halloween - it is magic! Who would not let that little vampire bite you? So cute! Excellent timing and alignment. Appreciation of your artistry and fostering. I sense a Halloween 2010 card set developing...so to speak! I suspect he's about to sneeze. That's the expression my Jonah gets when he's about to! I love that!!! So cute! Why, Mr. Draper, what sharp teeth you have! This is so cute I can't hardly stand it!!! In honor of Halloween, Perry is now the wallpaper on my PC!